Ronda is one of the pueblos blancos, the white villages that litter the Andalusian landscape. Public transport to Ronda isn't as scarce as it might seem, it's just that Andalusian bus companies aren't great at putting their information online! 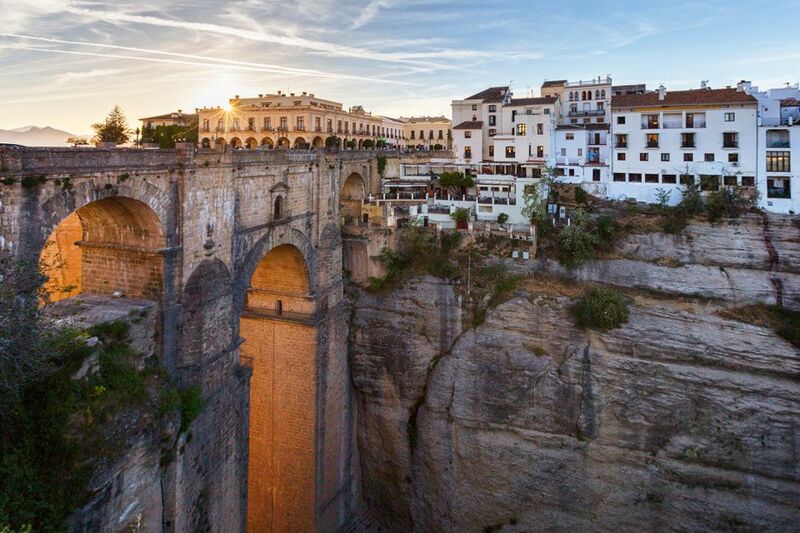 Below you'll find driving directions and bus and train information to get to Ronda from Cadiz, Jerez, Malaga, Fuengirola, Algeciras, Marbella, and San Pedro de Alcantara, as well as details of guided tours of Ronda from the Costa del Sol. Your departure points for getting to Ronda are limited and the journey is long from wherever you start, apart from the Costa del Sol. An ideal way to get to see Ronda is to take a guided tour. These tours usually include a hotel pick-up, all transport and guides as well as sometimes an extra stop along the way. If you're looking for multi-day tours and suggested itineraries that include Ronda, check out the following options. Toledo, Ronda, and the Alhambra are three of the most difficult sights to visit independently in Spain. On this tour, you can see all three. Starting in Madrid, you visit Cordoba on day one. Day two takes in Seville, day three is spent in Ronda and the Costa del Sol, day four is in Granada, and day five takes you to back to Madrid via Toledo. Though this tour crams a lot into five days, it is a hassle-free way of seeing some of Spain's absolute gems and conveniently leaves you back where you started in Madrid. Combine with independent travel around the north. From Seville: A tour of Andalusia should include these destinations: Seville, Granada, Ronda and Cordoba (Malaga is not on the list - if you are flying in and out of Seville, you can miss Malaga out). A suggested itinerary: Take the above transfer to Granada via Ronda; catch a bus from Granada to Cordoba; take the high-speed train from Cordoba back to Seville or to Malaga. From Malaga: The above transfers don't work from Malaga. Try this itinerary: Take the bus from Malaga to Granada; catch a bus from Granada to Cordoba; take the high-speed train from Cordoba to Seville; visit Ronda on the above transfer from Seville to Malaga.